Bing Crosby imitator Sugar Bear is "Hope"...? I assure you, this is hi-larious. You guys probably are reading this off Google Reader or an RSS feed or at Facebook or something, so if I type long enough, you probably won't get to the actual content of the post. And that's a darn shame. Because if you clicked through, man, there's all kinds of stuff. The wedding of Doug and K is still on, but its been a crazy day. I guess Kristen got some sort of infection where she had her surgery recently, so she's in the hospital. Nothing I would wish on my worst enemy, and certainly not on two of my favorite people. Honestly, it all sounds like something that would go down with me and Troubles, so I hope by virtue of marrying into the Steans-extended-clan, she ahsn't just wound up accidentally catching a nasty case of the usual Steans-luck. Let's all wish K and Doug well. So, yeah, there should be more content. I guess I like comics and robots and stuff, and I haven't mentioned Lynda Carter in a while. That's too bad. I should do that more often. I'm probably distracted by my weekly dose of Christina Hendricks, so, there you go on that. Uhm. Superman continues to have comics, and there's no new movie, but I guess if you asked, I'd have an opinion on what that should look like, but nobody did ask, so why lay that trip on you? There's probably something to be said about the space program, or the business model at DC Comics. But I'm not sure that's worth a post. Haven't seen any movies lately. Uh. Won't see the game on Saturday unless a Direct TV dish falls out of the sky to wine country in California. So I may be texting some of you during the game to get updates. Simon ran his marathon, and raised a good amount of money for the Terry Fox Run, so we should all applaud that effort. Well done, Simon. Jason is on Corpus Christi on the rainiest, coldest September I can remember since about 1993. We aearned the cold and rain, though. I mentioned Superman is cool, right? And Lynda Carter? Well, apparently I got nothing this evening. I think I'm going to go read a crime novel or something. Anyway, did you know that Wonder Woman puts on more clothing when she goes swimming than she does when she's saying, hanging around fighting crime? And when she swims, the ocean looks like the bottom of a Holllywood producer's pool? It's true. So, young junior naturalist Arden H-W has started a blog all about his bird-watching hobby. The League is impressed. That kid is going to be the next Audubon. 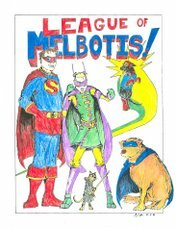 His blog posts are also already five times more coherent than anything you're likely to find here at League of Melbotis. I look forward to seeing what bird he covers next. So Where Are the Kents in the Silver Age? Fans of Silver-Age and Bronze-Age comics will note that the Kents are alive when Superboy is a lad, but by the time he becomes Superman, they're MIA. Well, at some point, DC decided to address what happened. And somehow, this is the story they put on the page. And, honestly, this sort of story makes more sense than 85% of what you're going to find in the typical Silver Age Superman story. Did everyone get the important tip for office safety in this week's episode of Mad Men? For the record, I'm agreeing with Simon and dropping JSA in December, if not before. Makes League cry, but... this just doesn't look fun. Schwapp! sums it up nicely. Also, the perspective or something is completely off on the ocver to JSA All-Stars #1. Without getting too much into it, as an example, Cyclone (front right) looks like she was drawn in at the last second by an 8th grader who doesn't know how big parts are, or where they really need to go. 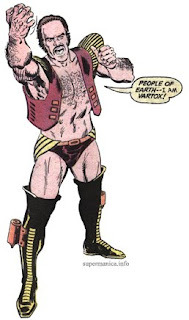 A few days ago I was going through some Superman back issues and stumbled across a cover with 70's-era Superman buddy/ foil, Vartox, the character with the worst design in all of comic-dom. I paused and said to myself: they should really find a way to bring this guy back, without changing a damned thing. Well, not change anything other than how seriously a reader in 2009 is likely to take ol' Vartox. 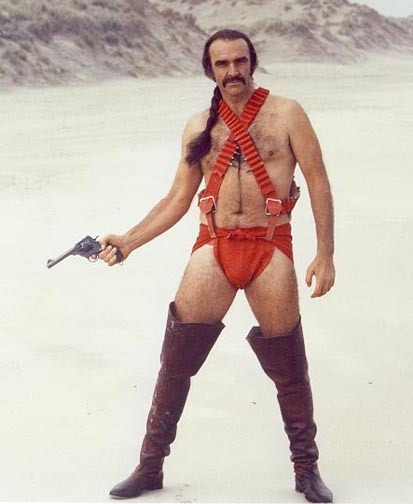 Vartox, by the way, is most likely what a very drunk comic artist decided was acceptable after seeing Sean Connery in the worst costume of all time in Zardoz. Well, ask and ye shall receive. DC December 2009 Solicitations were released Monday. The fellow on the ground is Dr. Mid-Nite. He is cool. I am really growing to like this Power Girl comic. I'm probably too forgiving of the 2006 feature film "Superman Returns". It has its flaws, primarily in the story department. But I think we can mostly agree that Brandon Routh made a fine Superman in his blues and reds. Many people don't know that Superman Returns, despite pulling in $200 million domestically, was considered a flop not just because it didn't set the world on fire, but because it had to also make back the money spent on about 20 years of WB kicking around Superman ideas. Some 10's of millions. One of the many ideas of the 1990's that blew through all that dough was that WB decided lightning should strike twice, and so gave the franchise to Tim Burton. This was probably not a great idea. Reportedly Burton didn't think too much of Superman, did not like Superman, and so was looking to just make his own movie, anyway. And just call it Superman so they'd give him $150 million to realize his fever dream of a superhero movie. I'm not sure exactly what happened, but thanks to the success of movies like "Con-Air" (which is a stupid @#$%ing movie. Seriously.) Nic Cage became attached to the project. Interestingly, Nic Cage is a Superman fan, as evidenced by the fact that he named his kid "Kal-El". No, really. He did. 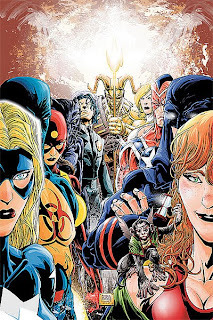 This all occurrd in the depths of what is now referred to as the Chromium Age of comics, which will make sense to non-comic people if you remember the 90's "EXTREME!!!!" movement. It basically meant comics became very stupid, very violent, and Superman had a mullet from about 1992 to 1998. No, really. He did. It also meant comics were sort of aplace where if you were trying to make sales, you had carte blanche do whatever made the character "dark", a dumb and meaningless term that Hollywood always wants to apply, for some @#$%ing reason, to The Man of Steel. So shut up about Superman Returns. The David Lynch Adaptation of "Dune"
is not very good and makes Herbert's prose seem subtle and airy by comparison. But, holy moley, does it look expensive. They just sort of skip over major plot points, though, don't they? While just sort of making a few bits up along the way. Credit where credit is due. Lynch cast pre-koo-koo Sean Young, a very young Virginia Madsen, and this Francesca Annis person who plays the Lady Jessica. To be fair, the challenge of translating that book was never going to be easy for anyone. I gotta say, though, the handling of Alia was surprisingly good. Oh, yeah. Dug and K are getting married. So... I've been doing a super bad job at being on hiatus. Solution: I'm actually going out of town in a few days to see Dug and K get hitched. As tends to happen, I get a little nostalgic when weddings roll around. Jamie and I had a magical wedding, and I hope for nothing more than that's exactly what Dug and K get. So I'm going to be out of pocket over the weekend. You're on your own. You know, back when they announced the Disney/ Marvel merger, my first thought was "huh. Wonder what Kirby's family thinks of the $4 billion price tag?" 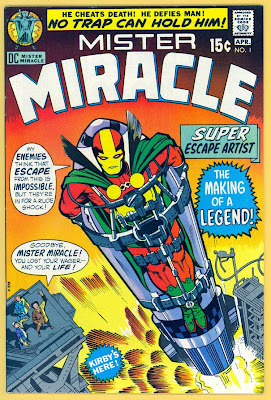 Jack Kirby's family is looking to regain rights to several of King Kirby's creations. Read more here. 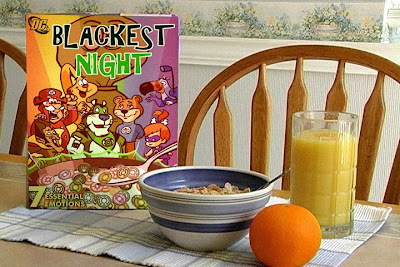 They were probably right about this being one of the world's greatest comics this year. If you ignore the existence of Jimmy Olsen. 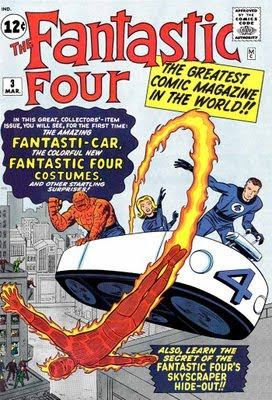 Which I do not, and never will..
Kirby's estate could claim all sorts of stuff, from the Fantastic Four to the Hulk. Thor. Several Avengers. Galactus (yeh!). Black Panther. The Inhumans. The Eternals. 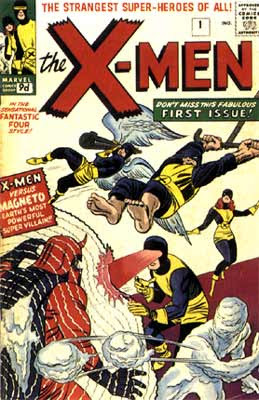 You know... the X-Men. Stuff like that. Now, Kirby is not a co-creator of Spider-Man, Iron Man and many other characters, and as Stan Lee is likely listed as a creator on many of these characters, I don't know how this will work. But certainly Captain America was Kirby and Simon all the way. Such a simple, straightforward little title back then. Now, an ample amount of the DCU was created by Kirby as well, but not quite as many high-profile DC characters (I mean, I know who Mr. Miracle is, but I'm pretty sure KareBear has no idea). And DC seems to have had a better relationship with Kirby. "Seems to" being the operative words here. Mom, this is Mr. Miracle. He's a super escape artist. Anyway, as interested as I've been in the Siegel/ DC case, I'll most likely be just as interested in how this shakes out for Kirby's heirs. After a while, you get a feel for a character that absolutely must have originally been a Kirby character. Its the only way to explain characters named things like "Unus the Untouchable". Here's a list I just found online of all of Kirby's Marvel creations. The series leapfrogs the Mercury and Gemini missions (I recommend "The Right Stuff" for your Mercury mission entertainment. $6 at Amazon.). We've been watching the episodes, and it's astounding to watch the show and understand the difference between the national mood at the time versus the national mood of today. As the Obama administration seeks to increase the funding of NASA by about 5% (a budget which has remained somewhat flat since 1992), its worth noting that the proposed budget of $18.7 billion is about 1/2 of one percent of the federal budget. For a single program, certainly worth noting, but an echo of '66, when it came in at more than 5% of the U.S. budget. I'm no federal budget expert, but the NASA budget didn't shrink by a whole lot, so looking at the year, I'd assume military and social programs increased in scope around that time. $18.7 billion is still a relatively small part compared to the $660 billion spent on the military in 2009. NASA is about problem solving, for the distinct purpose of human achievement. The goal of NASA is to look at the impossible, figure out the math behind what makes it appear impossible, and then work and work until you can manage the figures, the training, the machinery, etc... until the impossible is achieved. In many ways, NASA (and other space programs) are engineers and scientists unlocking the greatest puzzles put before us, and discarding common thinking in favor of seeing each insurmountable problem as an equation to be solved. If it takes enormous thrust to lift a small capsule out of Earth's gravity, then you put a 360 foot Saturn rocket underneath it. If you need lighter materials for your LEM, then you develop that material to specification. If you realize its going to be a bit of a challenge to actually get people back from the moon, you develop the math and the science to do so. Not to mention the computers, space sextants, and lunar vehicles to do so. If we applied that same thinking to problems outside of putting a person on the moon, one wonders how far that thinking could take us. What if we applied that same spirit to our national infrastructure issues (bridges, roads)? Feeding each other? Instead, I'd guess, we've turned that spirit of innovation inward, to amazing technologies that have revolutionized how and why we communicate, reinvented commerce, etc... And there have been tremendous side-effects in medicine, in education, and other areas that could never have been able to get there on their own. And while its been an amazing era in which to live, its difficult to point to much in the way of a shared national experience of the last decade aside from 9/11. Or even markers displaying that the government/ the US can achieve a specific goal if it tries. From a pragmatic view, its worth noting that the space program of the 1960's was also a boon to our technology companies in non-military applications. 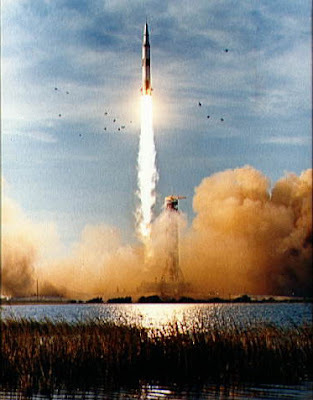 North American, Grumman, and countless others were contractors and responsible for achieving the goals of the Mercury, Gemini and Apollo missions. 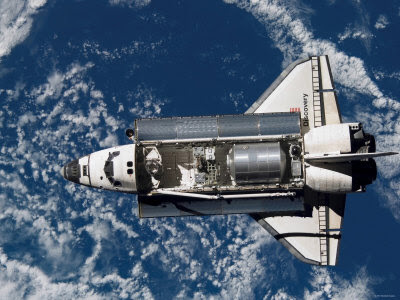 Keep in mind, that Space Shuttle Discovery saw its final flight in the past few weeks, and there is no vehicle planned to replace the Shuttle program. Its not without irony that I note that we're retiring not just the name, but perhaps the very spirit of Discovery. There's no question that something like NASA is one of those items that's easy to point to when one bemoans "big government". The average American will not be jumping in a rocket and vacationing in space any time soon. It may be that we have to look to smaller, cheaper efforts which ride on the shoulders of giants, such as Burt Rutan and his success with Spaceship One. But for as amazing as Rutan's feat truly was, Spaceship One did not enter Earth orbit, and it most certainly did not reach the moon. It replicated a feat forty years old. And since the 2004 X-Prize, the progress has been infinitely slower than the space race. And if we genuinely don't care? If we've got enough in the way of bread and circuses that we can't be bothered to look upwards anymore? I won't be all that surprised. Columbus's voyage was to find a route for commerce. The western expansion of the US was to find agricultural space to feed us, to exploit natural resources, etc... Our knowledge of the ocean floors will come from energy concerns looking for new deposits of resources. And while it gets us there, it will always be a question of dollars and cents and supply and demand. It will rarely be because its the challenge worth undertaking. So rather than point to the possible benefits you'll get from the space program (microwaves! Tang! ), I'd ask whether we've decided that we're a people who believe each dime spent should get us an entitlement? Or whether we want to celebrate, support, and demand that we're going to face down the impossible and make it a reality. I'd like to know that kids will think that if they study hard enough or work hard enough, they get to try an EVA one day. Or design the suit that makes the space walk possible. I don't have kids, but all I'm saying is, I wouldn't want to be the one to explain to my kids that he won't ever see a manned space mission because we didn't think it was important enough. 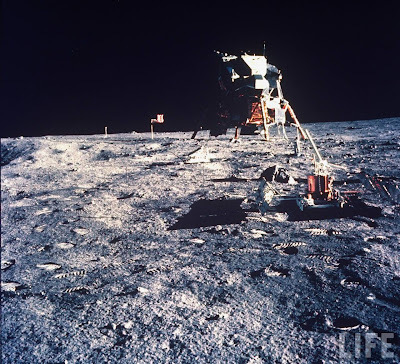 Its been 40 years since we stepped foot on the moon. 40. Even if we want to keep that eye turned inward, then what impossible challenge should we be able to overcome tomorrow? That's not to say NASA couldn't be operated more efficiently, or should be written a blank check. Stories you hear suggest NASA has become a slave to regulation and red tape (not just in the safety department) and has had a hard time keeping pace with modern technology management trends. But that doesn't mean you throw the baby out with the bathwater. That said, I'd like to see a person walk on mars before I croak.